Why continue to use traditional lighting when Hyperikon PAR30 LED Short Neck bulbs can provide a much higher lumen output for less money? Just like their incandescent and fluorescent equivalents, these energy-efficient bulbs can be used in lamps, ceiling fans, pendants, wall sconces and general overhead lighting. What makes Hyperikon PAR30 LED Short Neck bulbs different, however, is that they use much less energy, last 10x as long and give a better, cleaner and higher quality light. Reduce the number of light bulb changes and lower greenhouse gas emissions, saving you money and protecting the environment. It's a win-win for everybody! As a brand new feature, Hyperikon introduces CRI 90+, paving the way for a natural and true color experience in your surroundings. Our PAR30s are tailored to exceed your expectations when it comes to ambiance and color reflection performance. · Provides a stunning 800+ lumens. 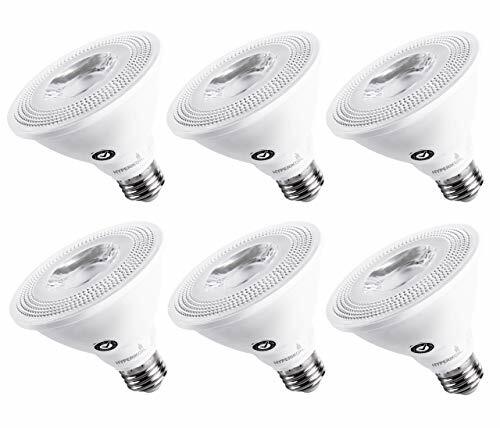 INSTANT SAVINGS - Reduce your energy usage and save on your electricity bill when you use 12W PAR30 LED Bulbs as 75W replacements. LONG LASTING - Hyperikon LED bulbs have an outstanding life rating of 45,000+ hours and are engineered to hold up against daily use. These bulbs can last 20+ years depending on use, eliminating the need to frequently replace your lighting. BRIGHTER & SAFER - Our PAR30 75W bulbs are brighter AND safer: illuminate your space with 900+ lumens, and rest assured knowing our LED bulbs are shatterproof and contain no mercury. CUTTING EDGE TECHNOLOGY - See vivid real-world colors all around you. Hyperikon's proprietary CR90+ technology display maps colors from a wider palette, faithfully reproducing every shade and hue in your surroundings.